With the end of the Soviet Union, Lituania, Latvia and Estonia became independent, from 1992 with separate railway administrations for its broad gauge network. The “St. Petersburg-Express” Berlin - St. Petersburg continued only for a wile to run via Lithuania, with gauge change at Kuznica. 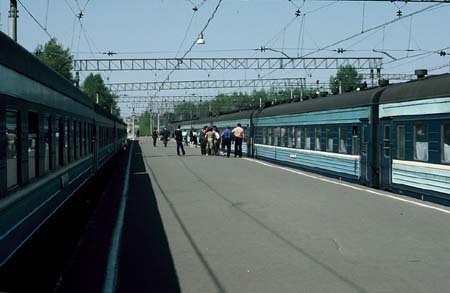 The line passes Grodno (now Hrodna) in Belarus. Between Kuznica and Grodno there is dual gauge. 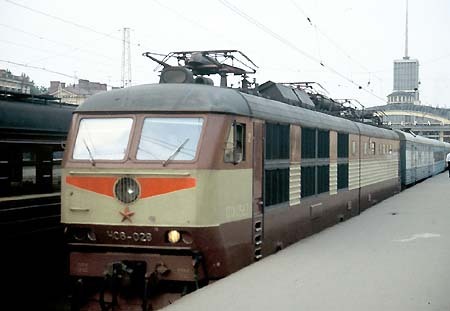 From the late 90s the express to St. Petersburg avoided Lithuania and changed to the route via Orsha, Minsk and Brest as a part of the Moskva-Express group of trains (see that chapter). Of course also the St. Petersburg branch of the “Vltava” from Prague took that way, with a different timing. What remained were the trains from Kaliningrad, the former Koenigsberg, to Moscow and to St. Petersburg, necessarily passing Lithuania. And also the maritime outpost Klaipeda, the former Memel at the coast of Lithuania, had been connected with Moscow. The author was surprised when he saw that train in 1992 during its stop at Klaipeda, coming from Kaliningrad and going to Moscow. That almost unknown train on a circuitous route obviously disappeared soon. During the first decade of the new century, the most remarkable expresses were the traditional “Yantar” Kaliningrad - Vilnius – Moscow on the direct route, the three expresses from Riga to Moscow and to St. Petersburg and the “Firmenny” Tallinn – Narva – Moscow. 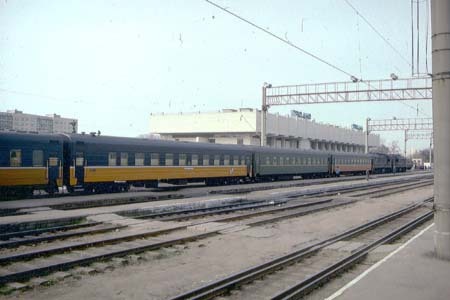 The yellow/blue Balti Ekspress from 1993 should have connected Tallinn in Estonia with Warsaw and also Berlin via Sestokai, thus avoiding Belarus. 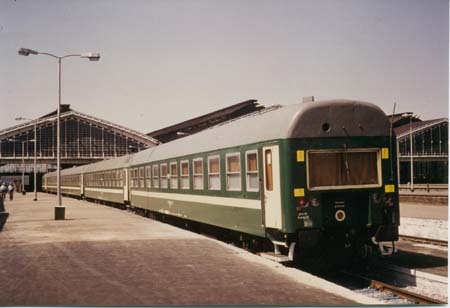 The timetable listed it in the first half of the 90s running Sestokai – Vilnius – Riga – Tallin. But in the late 90s all the trains from Tallinn to neighboring Latvia were stopped, reportedly by “privatization”, and also Latvia – Lithuania disappeared. 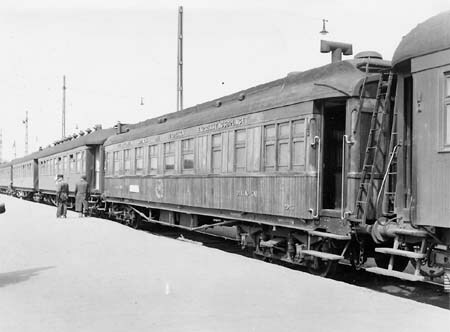 The three Baltic countries were no longer interconnected by passenger trains. A direct night train Warsaw - Vilnius via Sestokai, the place of gauge change, has run only for a short period. After the Baltics had joined the EU in 2004, the Rail Baltica project for a standard gauge high-speed line Tallinn - Warsaw optimistically was published - and even the unrealistic dream of a railway tunnel between Finland and Estonia. In 2011 a Rail Baltica conference studied the possibility of a standard gauge railway from Tallin via Riga and Kaunas to Poland. 1 Mest 18 "Livoniya Serviss"
Mest 57/81 = berths, no compartments. All cars LGDz, blue/yellow, only "Livoniya Serviss" dark blue, "Livoniya" maroon/cream/black/red line, locomotive orange/cream/brown. Train 176 Moscow - Bologoye - Pskov - Tallinn, departure Moscow Len. May 9, 1986: ChS2T (3kV dc), 1 postal van, many Mest36 and hard cars (couchettes without compartments). Colors: Locomotive dark-red, van green, other cars blue/light-blue. 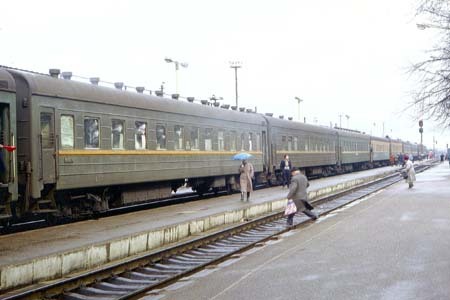 Train Estonia Moscow - Narva - Tallinn had a similar consist. Later Eesti Raudtee used red TEP70 diesels on the Tallinn - Narva - Moscow train. 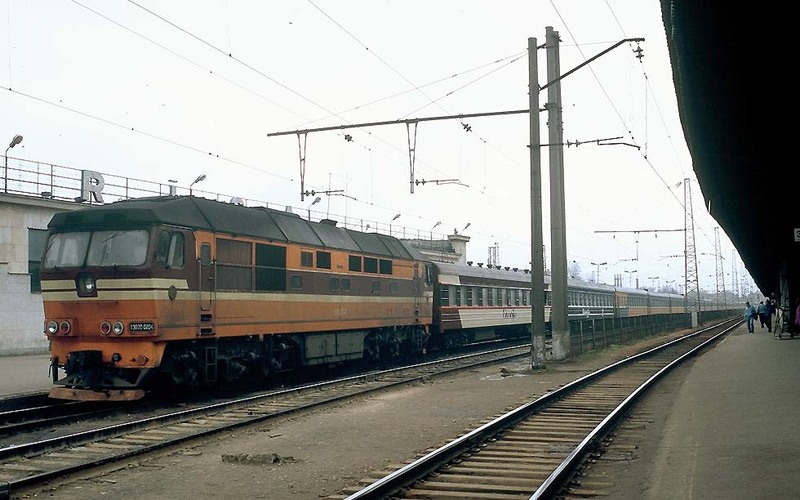 Moscow - Minsk - Vilnius - Kaliningrad, Mest36, Mest18, hard cars and diner, traction in Kaliningrad district later by TEP70 diesels. Traditionally light-blue/yellow cars. 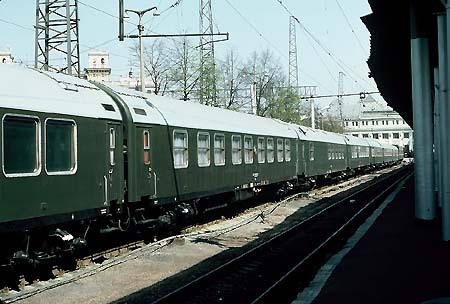 East Germany or the GDR had two modern state trains with sleepers, saloons and diners in the style of conference rooms, one train for the government and one for the military. 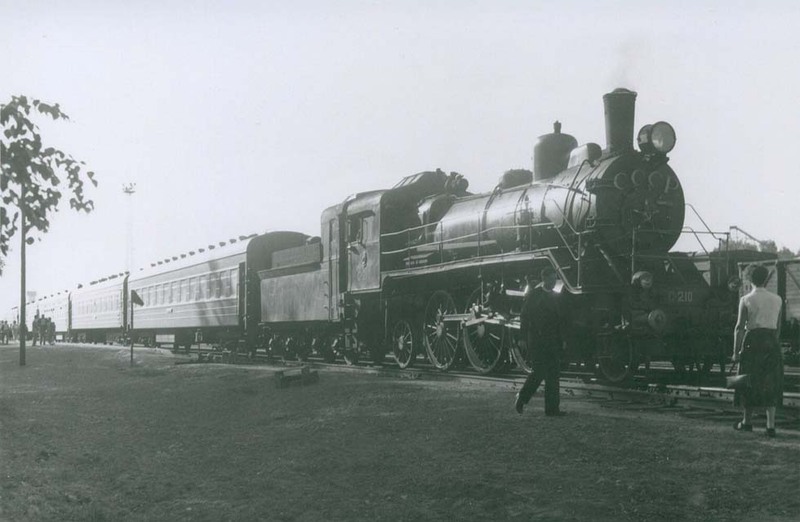 As the rulers preferred flying, the government train came only a few times to Moscow on so-called test runs. 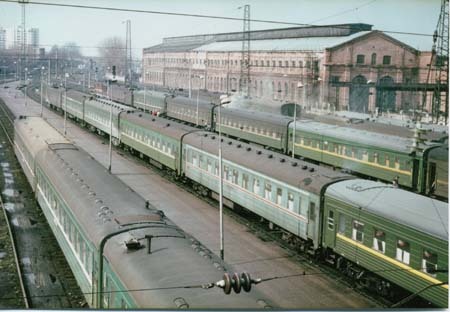 Once however it brought a delegation to the KSZE conference at Helsinki, via USSR, with change of bogies at Brest. After liberation that consist became the tourist train Koenigsberg-Express. After the Kaliningrad district had been opened to tourists, the Koenigsberg-Express had regular runs from Berlin on the “strategic” standard gauge, initially to Kaliningrad. suburbs, described by the chapter Travels. These quasi-regular runs ended in 1995. 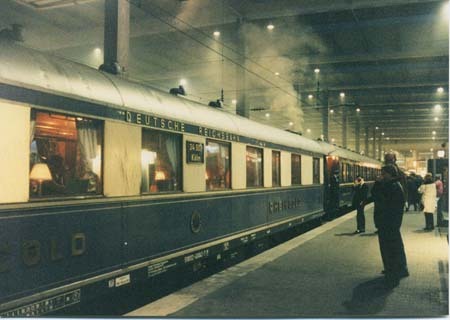 Even the Nostalgie Istanbul Orient Express appeared in the former Koenigsberg. A surprise in 2004 was the contract for a once-weekly Talgo tourist train Berlin - Kaliningrad - Vilnius - Riga - Tallinn - St. Petersburg. 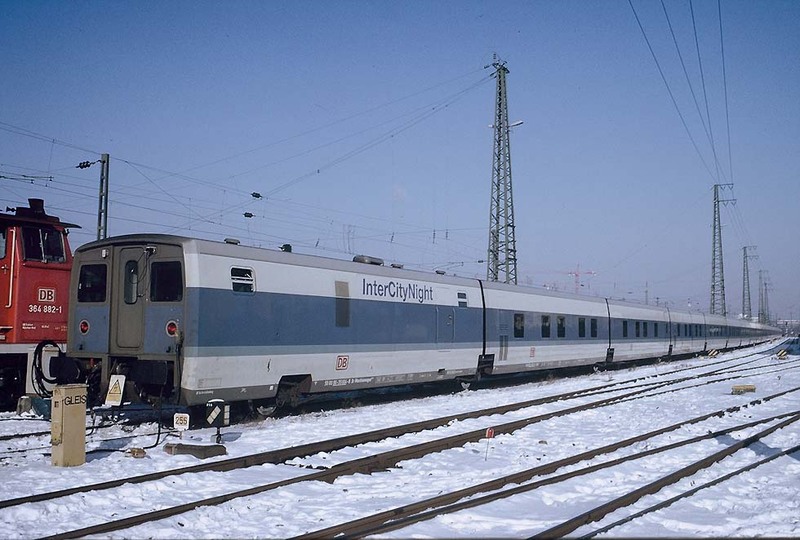 It was planned to refurbish existing German Talgo cars for a train consisting of 20 articulated sleepers with two-berth compartments, en-suite facilities, a bar car, a restaurant car and some saloons. The announced departure in August 2005 however was "delayed". In the meantime the nostalgic "Classic Courier", consisting of black refurbished day coaches, made tourist trips from Berlin to the former Koenigsberg. 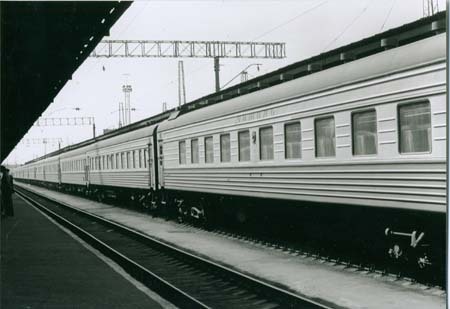 A TV report of 2009 showed the Bernstein Express, consisting of sleepers and diner of the former Polish government special, providing tourist trips to St. Petersburg via Vilnius, Riga and Tallinn, not entering the Kaliningrad district. 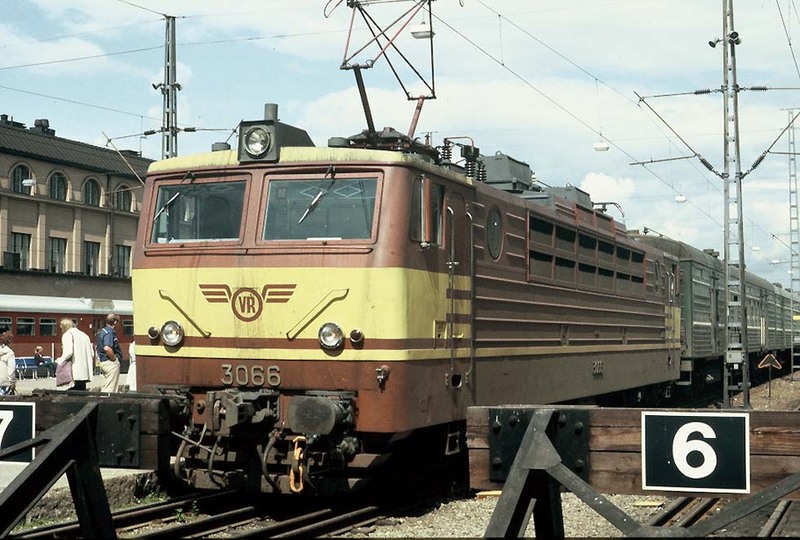 A train ferry Estonia -Finland, proposed between the wars, never was introduced. 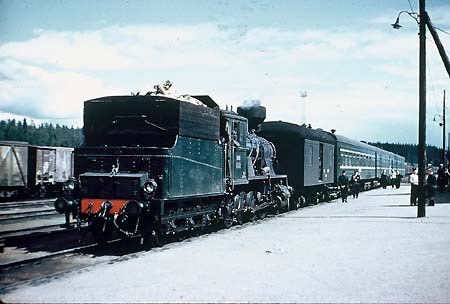 Finland has broad-gauge like Russia. After the "winter war" of 1940, Soviet military trains Leningrad - Hanko started, from 1944 Leningrad - Porkkala. In 1954 the express Helsinki - Moscow (later baptized "Tolstoi") followed, from 1970 to 1976 also Turku-Moscow, with sleepers by SZD, during steam-age in Finland hauled by Tr-1 (2-8-2). A day train St. Petersburg - Helsinki became the "Repin" with blue/pastel colored Russian cars. In 2005 Finland got twin-deck sleeping-cars from Talgo for domestic services, expected also for services to Russia. In December 2010, after long disputes, a consortium started Helsinki – St. Petersburg services under the label “Allegro”, replacing other trains. Tilting diesel units of an Alstom Italian-built pendolino variant, an evolution of Finland’s Sm3, were introduced, capable of a speed of 220km/h. 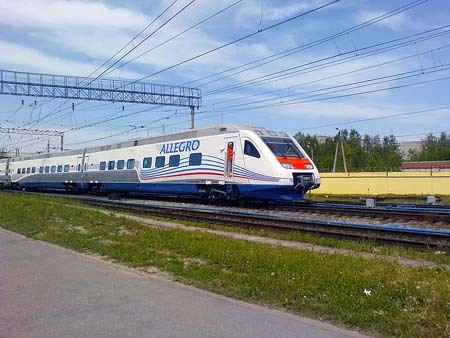 In 2012 the traveling time Helsinki – St. Petersburg was 3 hours, compared to almost 6 hours with conservative trains years before - and the “Allegro” proved successful.